New technologies are shedding light on what really makes adolescents tick—and providing clues on how we might reach them better. A recent interview with British neuroscientist Sarah-Jayne Blakemore, the author of the 2018 book Inventing Ourselves: The Secret Life of the Teenage Brain, begins with a caveat. In matters of settled opinion, science has often found itself in the role of provocateur, even saboteur—prodding at conventional wisdoms until they yield unexpected truths, and sometimes toppling them entirely. The mysteries of celestial bodies, heredity, and mental illness have all undergone dramatic rethinking. So it shouldn’t be entirely surprising that new technologies that allow us to peer into the brain as it processes information are driving a revolution in our understanding of human cognition. Images from fMRI machines, for example, reveal that the brain is less like a collection of discrete, specialized modules—one for speech and one for vision, the old model—and more like an integrated network of functions that support each other. Those same images show that cerebral networks undergo dramatic, global maturation well into our 20s. The findings have cast doubt on many theories about adolescence. For too long, assertions about teenagers—from their purported irrationality to their apparent sense of invulnerability—have circulated widely and uncritically. The new research suggests that we have plenty of rethinking to do. Adolescent rodents and adolescent humans are susceptible to peer pressure—and members of both species take risks at much higher rates when in the presence of companions their own age. In a study conducted in 2005, neuroscientist Laurence Steinberg asked teenagers and adults to play a virtual driving game that tested their willingness to take risks as traffic lights turned from green to yellow to red. Participants were penalized when accidents occurred. Adolescents responded to the risks as well as adults did and performed about equally when playing alone. But in the presence of peers, risk-taking surged among the teenagers and young adults—risky driving increased threefold for 13- to 16-year-olds, and the number of crashes spiked—while remaining flat among adults. 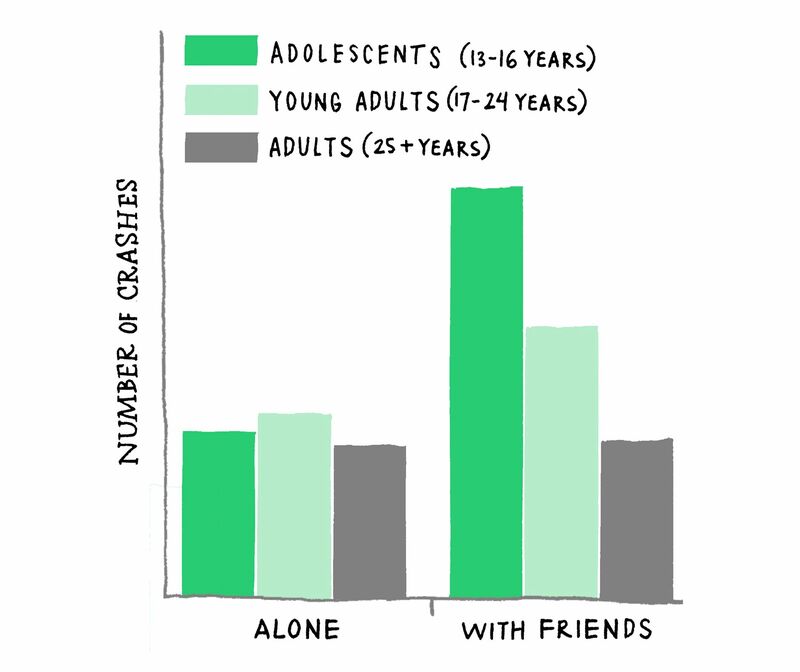 In driving games—and in life—adolescents operate a vehicle safely when alone. Around peers, though, everything changes. A study involving mice and alcohol consumption reached a similar conclusion. That 2014 experiment exposed rodents of different ages to the equivalent of an open bar: They could drink alcohol at their leisure. The adolescent mice—those at the tender age of 4 to 5 weeks—drank about as often as adult mice when by themselves. But in the presence of other juveniles, they settled in for a bender, drinking 25 percent more of the time. There was no change in the drinking of adult mice. In a few recent experiments, peer pressure emerges as a measurable biological phenomenon, crossing over into the perceptible world like the first earthquake waves etched onto a seismograph. A 2013 study found that when human subjects were told that a peer was watching them, skin conductance readings—a measure of the electricity triggered by stress and arousal—were consistently higher in adolescents than in either adults or children. Brain scans administered at the same time revealed telltale flares of greater activity in key regions of the teenage brain linked to self-awareness and the ability to understand others. It’s never been a question of feeling invulnerable—for teenagers, there’s just something about the presence of peers that is transfiguring. They understand the risks, and take them anyway. In 2014, Blakemore and two colleagues gathered brain images of 33 people and plotted the growth rates of individual limbic systems over time. They also looked at another critical brain region: the prefrontal cortex. Adolescent brain scans reveal that reward systems mature well before inhibitory systems. That tends to confirm a major theory of teenage development. The charts that resulted (above) show that limbic structures like the nucleus accumbens changed only modestly during adolescence while the prefrontal cortex experienced a dramatic shift in volume, shrinking and reorganizing as it pruned away unused synaptic connections. The upshot? The brain scans seem to indicate that the limbic system—the brain’s reward system—is mature and firing on all cylinders in teenagers, while the prefrontal cortex, which is responsible for things like self-control, planning, and self-awareness, is still busy developing. It’s not all gloom and doom. The teenage years are “the last, great neuroplastic era in our lifetimes,” according to Steinberg, referring to the brain’s continued capacity for intellectual and emotional growth. The same emerging circuitry that makes teenagers vulnerable to risky behavior and mood swings also confers significant advantage on adolescent learners. A snapshot of the rodent brain at a moment of learning: The young mouse’s brain reveals a more powerful learning response. At the deep neural level, new information is written into the gray matter of the brain itself—expressed in structural changes to synapses, which, through repeated exposure, form increasingly durable webs of memory. A study conducted in 2002 provides a fascinating window into the brain at the very moment of learning. 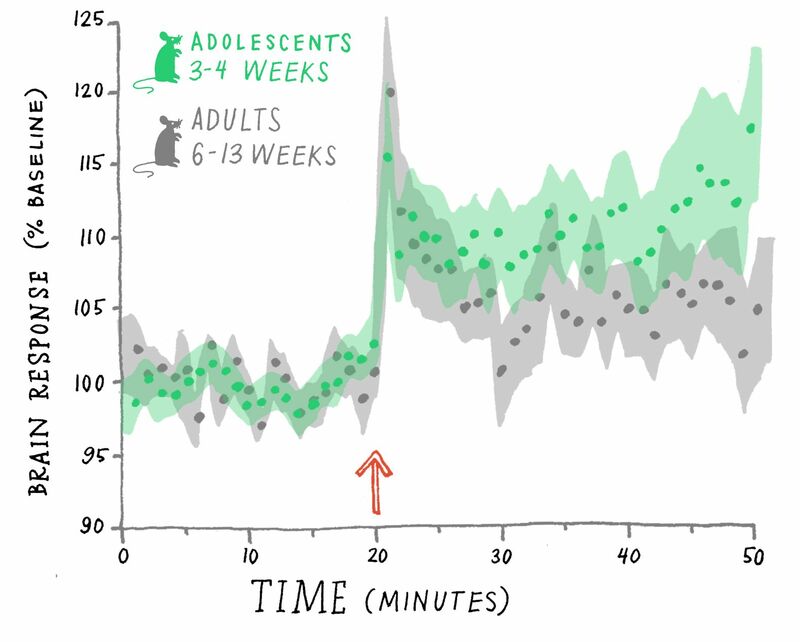 The chart above shows the electrical response in both adolescent and adult mice to a novel piece of information, represented by the red arrow. Like a bell struck more sharply, the brain of the adolescent mouse produces a more dramatic reply—and then sustains it for longer. That’s good news—and a clear signal that the teenage brain is by nature more receptive to learning, says Frances Jensen in her 2015 book The Teenage Brain. 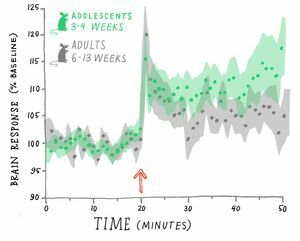 Adolescent animals simply “show faster learning curves than adults,” and we retain the capacity to improve even fundamental attributes like our IQ well into our teenage years. Take the direct approach: Talking to teenagers frankly about their brain development can provide useful context for their emotional worlds, and reset their expectations about their potential for continued intellectual growth. “We know that people like biological explanations. It’s true in neurological stroke patients—showing that the brain is plastic and can change and rehabilitate is really useful,” Blakemore said. Schools are aware of many of these social dynamics, and have used teen leaders, social influencers, and appeals to fairness and justice to change behaviors around vaping, bullying, and academic cheating. Teach self-regulation: It’s not too late. The prefrontal cortex, which governs executive functions, is still developing and remains highly responsive to the environment and to training during adolescence. It stands to reason that explicitly teaching self-regulation, long-term planning, and empathy might have particular benefits for teenagers. According to Steinberg, efforts to improve the self-regulation of teenagers “are far more likely to be effective in reducing risky behavior than are those that are limited to providing them with information about risky activities.” And social and emotional learning programs that show adolescents “how to regulate their emotions, manage stress, and consider other people’s feelings” can have positive effects on executive functions more generally, improving focus and self-discipline, and setting teenagers up for academic and professional success well beyond high school. The charts in this story were drawn by illustrator Leigh Wells, and adapted from studies by 1) Margo Gardner and Laurence Steinberg, 2005; 2) K.L. Mills, A.L. Goddings, L.S. Clasen, J.N. Giedd, and S.J. Blakemore, 2014; and 3) N.L. Schramm, R.E. Egli, and D.G. Winder, 2002, via Synapse magazine, courtesy of Wiley-Liss, Inc.